Luton’s display at Bristol Rovers on Saturday was a performance of champions, according to home boss Graham Coughlan. The visitors had led 2-0 after a fine first half performance, only to see Jonson Clarke-Harris pull one back on the stroke of half time. However, rather than lead to an onslaught from the Pirates, they were held at arm’s length for the majority of the second period, with only Clarke-Harris’ effort blocked by Jack Stacey their real chance, as Town shut up shop effectively. It led Coughlan saying: “I thought, going into half time that the two team talks changed. “Us going in at 2-0 down you could possibly say the game was over and done with, buried. The timing of our goal was brilliant, but I have got to commend Luton. “I thought the way the controlled the game was brilliant, the way they halted the game, broke momentum, and broke the game down in the second half and that’s what champions do. 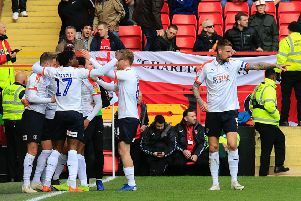 Before then, Hatters had been by far the better team in the first period, James Collins and Luke Berry on target, as it came as something of a surprise that Town were breached for only the second time in six away games. Coughlan continued: “Yes we lacked a bit of quality that Luton have but they cut us open, maybe two errors for the goal and we restricted a top, top team in this division. “With a little bit of luck, with lady luck shining on us we could have got something out of the game, with Jono having that chance late on. “They showed a lot of character, at the end of the day you need quality and maybe a little bit more than what we have got if you are going to compete with a top seven team, a top of the table team like Luton. “But we are giving it a go and Luton will feel as if they were in a game and that’s all I ask the lads to do. “Each and every one of them did that, maybe we switched off in one or two key moments but that’s what happens against top sides, you get punished. “I have to expect the difference between our football club and Luton, I have to expect the quality they possess and how they have been built and put together. Although defeat saw Rovers sitting just three points from the drop zone, Coughlan wants them to emulate the Hatters this time next year. He added: “That is something I would like to look at and ask how do we do something like that? “If we do I fancy us to be where Luton are, but I am impatient and I don’t want to wait three years. "I want that here and now over the next 12 months and that is what I am looking to do at this football club, to build something up. “There is no talk of bottom tiers or going down, we don’t talk like that.